At Hall and Butterfield Family Dentistry, we specialize in a variety of dental services in order to better serve our patients. Listed below are the services and procedures we perform here in our office. Click on an area of interest for more information. At Hall and Butterfield Family Dentistry, we’re experts at solving problems. But day in and day out, our goal is to avoid dental emergencies and promote oral health with the best routine care around. 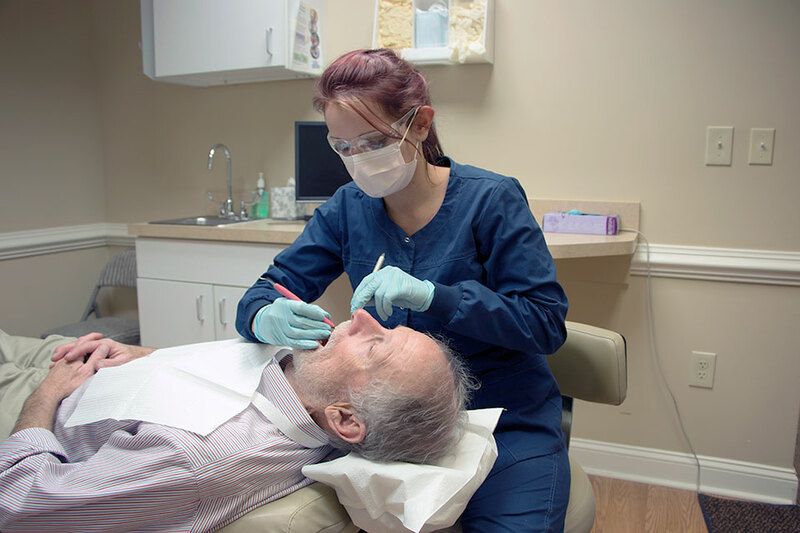 We encourage our patients of all ages to schedule regular cleanings and checkups twice a year. At our office, there are two main components to providing the best routine care for the whole family: the knowledge, experience and compassion of our staff, along with the latest in oral care technology. Composite fillings are a mixture of glass or quartz filler in a resin medium that produces a tooth-colored filling. They are sometimes referred to as composites or filled resins. Composite fillings provide good durability and resistance to fracture in small-to-mid size restorations that need to withstand moderate chewing pressure. Less tooth structure is removed when the dentist prepares the tooth, and this may result in a smaller filling. There are several reasons why a tooth may need a crown. Generally speaking though, a crown can make your tooth stronger and improve its appearance. If a tooth is comprised of 50% or more filling, a crown may be a good measure to help prevent a fracture of the tooth. When a tooth breaks due to being weakened by a large filling, sometimes it will not be salvageable and extraction of the tooth is the best option. Everybody loves a bright white smile, and there are a variety of products and procedures available to help you improve the look of yours. In our office we use the Zoom in-office and home system. Many offices use in-office whitening alone without letting patients know that after a few days post treatment there will be an inevitable rebound back towards the original shade of the teeth. To combat that we include a home component with our in-office treatment. Once upon a time, if you had a tooth with a diseased nerve, you’d probably lose that tooth. Today, with a special dental procedure called root canal therapy, you may save that tooth. Inside each tooth is the pulp which provides nutrients and nerves to the tooth, it runs like a thread down through the root. When the pulp is diseased or injured, the pulp tissue dies. If you don’t remove it, your tooth gets infected and you could lose it. There’s no reason to put up with gaps in your teeth or with teeth that are stained, badly shaped or crooked. Today a veneer placed on top of your teeth can correct nature’s mistake or the results of an injury and help you have a beautiful smile. Veneers are thin, custom-made shells crafted of tooth-colored materials designed to cover the front side of teeth. They’re made by a dental technician, usually in a dental lab, working from a model. Crowns and conventional bridges or dentures may not be your only options when replacing missing teeth. For some people, dental implants offer a smile that looks and feels very natural. Surgically placed below the gums over a series of appointments, implants fuse to the jawbone and serve as a base for individual replacement teeth, bridges or a denture.Implants offer stability because they fuse to your bone. Nitrous oxide (laughing gas) has been around for decades, but some patients don’t realize it’s still a great option for many dental patients and procedures. Nitrous oxide allows us to provide conscious sedation at times when full sedation isn’t required but pain relief beyond novocaine is needed.